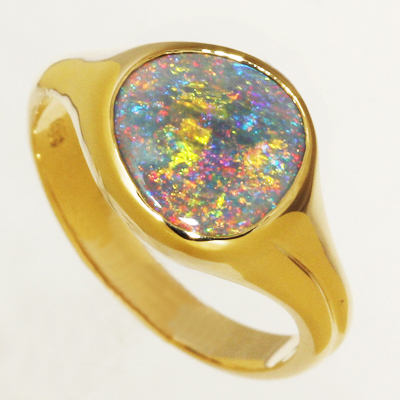 14k yellow gold SOLID BLACK Opal Ring. Our Swiss born Jeweller completed a four year Goldsmith apprenticeship in Switzerland and graduated with Honours as the top of the class. Over the last 30 years this award winning jeweller has created over 9000 pieces of jewellery, with opal being her specialty! A beautiful Floral Harlequin patterned stone abundant with loads of bright and strong colours. With reds, oranges, green and purple moving and sparkling at the slightest turn. The red and orange are gilded with a golden glittery show.